The Poconos Vacation House offers a great getaway experience in a conveniently located four season resort community. In the summer season, you will have FREE access to our private, exclusive, white sand beach. In the winter season, you will be just minutes from some of the best skiing that the Northeast has to offer. 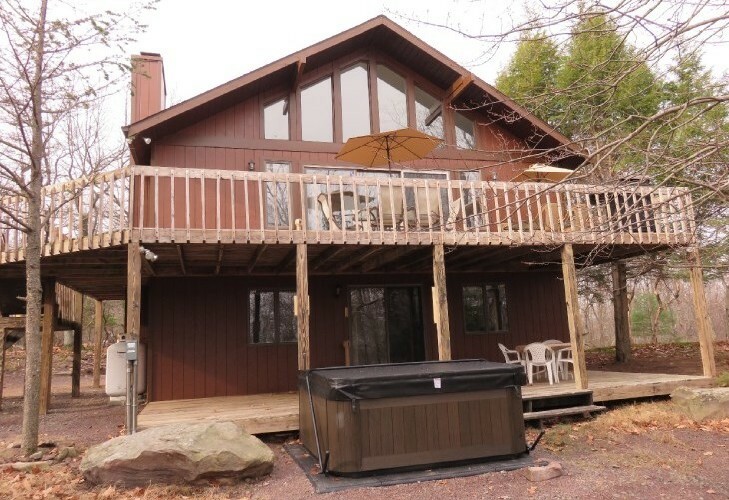 Our Poconos vacation rental is perfect for a weekend getaway in the Poconos! While vacationing in the Poconos, there is plenty to do and see. There is an indoor water park down the road, as well as plenty to do in the area. Casino gaming, white water rafting and paintball are popular choices.Quaint restaurants and lakefront dining help to make your experience special. Experience vacationing in a beautiful private community, allowing you to do as much or as little as you like. Perfectly located, and close to all major highways, the Poconos vacation house offers a private location, large wrap around deck, mountain views, a full size billiard table, a full size ping-pong table, foosball table, game room and hot tub. Multi levels, cathedral ceiling, and a large glass wall of windows gives you the feeling of openness and space. The property provides a hot tub, outdoor barbecue grill, outdoor seating, two fireplaces and your own laundry room with washer and dryer. Modern amenities include televisions on every level, two and a half bathrooms, king size beds, microwave, dishwasher, coffee maker, CD radio's, and an I-Pod stereo radio. Close to New York, New Jersey, Philadelphia and Connecticut, it is easy to come and have a great time in the Poconos. The Poconos vacation rental located in Lake Harmony, Pennsylvania welcomes you with your own welcome basket. Come and enjoy this property. Do not wait, contact us right now! This is the one, don't hesitate to make your reservation now, because you deserve a great getaway experience! Copyright ©2019 poconosvacationhouse.com All rights reserved. Website development and promotion by wisnet.com, LLC.